Association Management Group Supports Dirty Girl Mud Run with Sponsorship and Race Team | Company Newsroom of Association Management Group, Inc.
April 3, 2016	(Press Release) - Association Management Group (AMG), one of the Carolinas' largest professional homeowner association managers with five offices in North and South Carolina, recently signed on as a financial sponsor of the Dirty Girl Mud Run scheduled for Saturday, May 28 in nearby Archdale. More than a 5K, this unique women-only run through a muddy race course polka-dotted with obstacles ranging from walls to climb over to water pits to wade through, benefits Bright Pink®, the only national non-profit focused on the prevention and early detection of breast and ovarian cancer in young women. The organization educates, equips and empowers the 52 million young women in the US between the ages of 18 and 45, to be proactive, to reduce their risk for these diseases and detect them at early non-life-threatening stages. Nearly a million women have participated in this race across the nation since its debut in 2011. Jamie Rettie and Crystal Weaver, Certified Manager of Community Associations, organized team AMG Girls after seeing a post on Facebook about the fundraising event that focuses more on camaraderie and girl power than competition and victory. "My grandmother is a breast cancer survivor and two friends are ovarian cancer survivors," said Rettie. "Life can be heartbreaking at times. It's important for women to come together to support one another. Participating in this run is a privilege because at this point in our lives we are healthy enough to do so. This may not always be the case, so doing an extreme woman-only event is perfect to show support for those who are not healthy enough to do so." 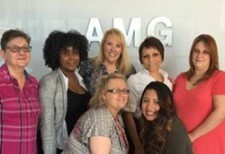 AMG has a corporate culture of community support, enjoying 100% service by its employees in all five offices. "Our AMG Girls team is fueled by this motto: Decide what you want and go for it, especially if it can make a difference and benefit others," Weaver explained. "That's what we're doing-for ourselves, and cancer awareness and prevention." To donate to the cause, visit AMG Girls' page www.crowdrise.com/DirtyGirlMudRunGreensboro. For more about the Dirty Girl Run, visit godirtygirl.com/Greensboro-nc-2016/?gclid=CO7E2ai748sCFVg6gQodrukDKA. For more about the event beneficiary, visit www.BrightPink.org.